Alissa Sandoval is the communications intern for Samaritan’s Purse in Haiti. Weddings are joyous occasions. No matter where you are in the world, weddings are a sign of love and happiness. In the lives of Mario and Marie France, the decision to marry carried deeper meaning. 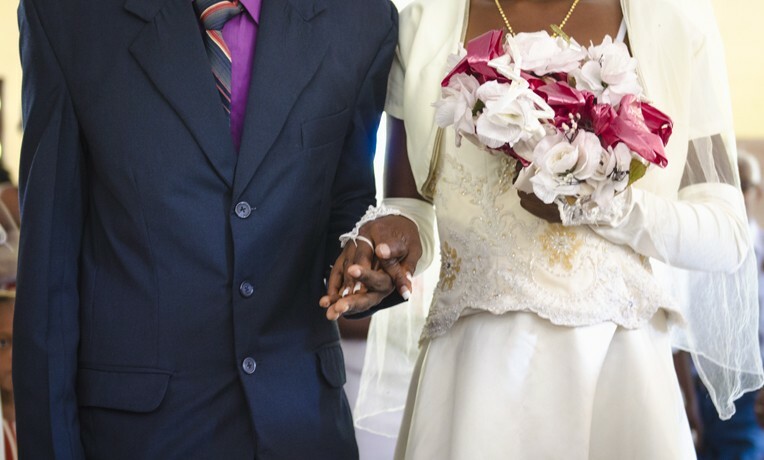 Their marriage took place because of the renewing of their minds through the Word of God during a training they received from the gender protection program in Haiti. The program educates men, women, and children on the effects of gender-based violence and gender roles in Haitian society. They also focus their trainings on how to build Godly marriages and sustain a solid family rooted in Christ. In rural mountain communities in Haiti, weddings are rare. It’s too expensive to feed guests and hold a reception, and it’s commonly believed that weddings are solely for those who are wealthy. The majority of couples enters into a common law relationship and decides to begin living together—it’s rare to find couples that have chosen to hold a ceremony and reception in honor of their marriage in these remote areas. Mario and Marie France considered marriage after attending training sessions with gender protection program. The training sessions reflected the importance of marriage amidst a society where marriage isn’t a norm. After listening to the training sessions about marriage, Mario understood that he needed to ask Marie France to marry him. The curriculum they encountered renewed their mindset and helped them see the necessity for mutual respect and marriage. They want their marriage to honor Christ and to be a blessing to their family and those around them. On Saturday, January 23, 2016, Mario and Marie France exchanged vows and grounded their marriage in Christ. Their wedding was a blessing to the entire community of Lamanche. Everyone made their way to the hilltop church where the ceremony would take place. The church was packed, and there were children with their faces pressed to cement grates, watching the ceremony through the windows. Samaritan’s Purse staff members Edna and Pastor Abraham pray with Mario and Marie France two days before their wedding. When the couple entered the church, their friends and family crowded the aisle so they could get a glimpse at the bride as she made her way through the church with the groom. Everyone knew each other, and everyone wanted to be present to show their support and love for this couple. When I returned to my seat after snapping some photos of the couple saying “I do,” an older woman next to me pointed to my camera and said, “mwen vle we,” meaning she wanted to see the photos. I showed her the screen and she pointed to the bride. She continued to say her name and explained that she knew Marie France—she had great pride in knowing the young woman at the altar getting married. Seeing an entire community support this decision that the couple was making moved my heart. It was a blessing to witness Mario and Marie France say their vows and to sit among their family, friends, and neighbors. During our preliminary interview with the couple, their excitement for their coming wedding day was apparent. They’d automatically lean into each other and laugh when we would ask them questions about their story and their decision to get married. It was evident that they both shared the desire to honor each other and love each other with Christ’s love. They saw that love and marriage meant blessing each other. Watching the happy couple caused me to reflect on a conversation I had with our previous deputy country director, Albert. We were out on the field visiting an agriculture program, and he asked me if I was planning on getting married soon. I laughed and said no, quickly adding that I wanted to get married later in life because I didn’t want to be prevented from traveling and I didn’t want to be “tied down.” He stared at me and laughed. I remember immediately thinking “whoops” in response. I checked my heart and realized that I had been doing the same thing. Linking marriage to the misconception that I’d be “tied down” or never live abroad again had caused me to see getting married as a burden—the exact opposite of what God intends for it to be. I had been overlooking the fact that God is our Father, and as our Father, He wants good things for us. Marriage is designed to be a blessing to each other and to bless those around you, much like the wedding of Mario and Marie France. If I’m supposed to get married, God has intended to use marriage as a blessing in my life, not like a burdensome weight that cannot be removed once you say, “I do.” That’s certainly not how God views the church as His bride. The gender protection program teaches their training attendees how to mutually bless each other—to build each other up and work together through equal partnership in marriage. Mario and Marie France went through training, grappled with the material presented to them, and applied what they had learned despite how marriage is normally viewed in their society. This is an exceptional testimony of the work that Samaritan’s Purse is doing in Haiti. The only truth that has the ability to pierce through prejudices and societal norms is the truth found in God’s Word. My misconceptions of marriage did not come from a background of living in a remote, mountaintop village in Haiti. My perceptions of marriage needed to be renewed as well. God is constantly renewing our minds (Romans 12:2) so we can better understand His word and purpose for our lives. God desires good for our lives and wants to bless His children, not burden them. I feel blessed to have met a beautiful couple that internalized these truths and now can be a model of Christ’s love for the church in their community.